The flip is fluff (always wanted to type that) by comparison, though I am right now revising my take on it. I originally described Gershwin's piano work as clunky on this number (Half of It Dearie, Blues), but, at least at 80 rpm, it's not only not clunky, it's impressively fast.. And I talked about too many Rhapsody in Blue quotes--specifically, the double-time chords George throws in a few times too often--but now I'm not positive they're actual RIB quotes. They're standard parallel "big city" chords of the type we expect from George. Maybe they're meant to evoke RIB, maybe not. And Astaire's singing on the Dearie number, which I described as pretty bad, is actually perfectly adequate. The song is silly, but that's the job of novelties. It's not the dud side I judged it to be, unless we're comparing the song and its performance to the magnificent flip, and that would be setting an unfair bar. Bottom line is, this version of Fascinating Rhythm changed the way I hear Twenties pop music, and Twenties pop is my favorite pop. So it's awesome to have it in my collection. First up, the sides at the proper 80 rpm. Then, for comparison, my two 78 rpm rips. Enjoy! 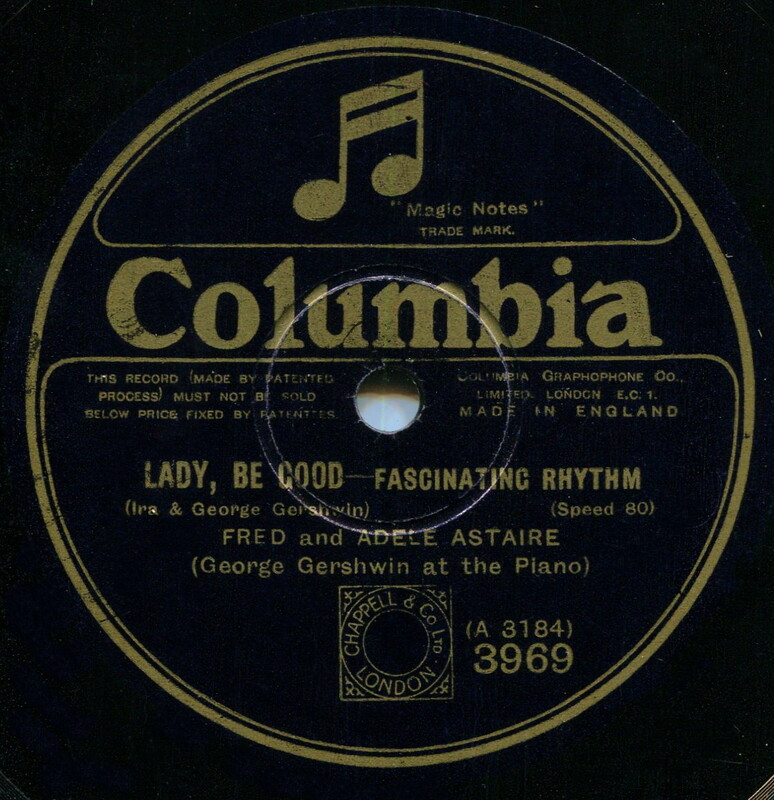 Fascinating Rhythm/The Half of It...--Fred and Adele Astaire, then Fred only, with piano by George Gershwin, at 80 rpm. UPDATE: Buster and I both agreed that 80 rpm is way too fast a playback speed, despite the label indication--namely, that, for some reason, the label sped things up by recording at a slower speed, as American Columbia accidentally did with Bing Crosby and Al Rinker's I've Got the Girl of the same year. 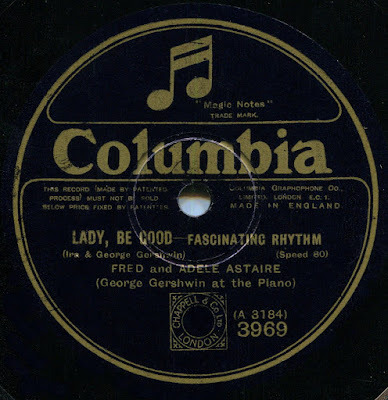 It could have been accidental in the case of UK Columbia, too, or the label may have done it deliberately to alter the sound of Astaire's singing or George's piano tinkling--to make things sound brighter and, to use a period term, snappier. Tho knows? Anyway, Buster took my 78 rpm rips and slowed them down about 1/4 tone, and here are the results: GG, FA, Corrected speed. I agree with Buster that his speed corrections sound just right. What do your ears think? Cool, never heard of such. And amazing that you've managed to hold onto the record this long! I've had a bad transfer of this for many years; yours is FAR better sounding. I've always thought it was pitched too high - even the 78 rpm version seems sharp, although it is much closer to the Fred we know from his later recordings. I hope you won't mind that I took it down even a little bit more - see what you think of this. I like your file! The slight drop in speed sounds right. About 1/4 tone, no? I've always been okay with 78 for this, but I was surprised at how cartoonish (for want of a better word) it sounds at 80 rpm. 80 rpm is flat-out wrong. I'll link to your file in my post--I'm assuming you're okay with that. Very glad to have a savvy fellow blogger like you dealing with the speed issue, since I'm deliberately putting all my focus on sound quality. Playback speeds are a hideously complicated thing, and I'm not going there. I fret over sound like you wouldn't believe, and I'd be tipping the stress cart by taking on an extra concern. And, as you've shown, things are easily correct post-rip! You're correct. My 78 collection has gone through three versions. The original contained about 800 sides, most bought in Scotland (mostly, American dance bands on cool UK labels). I don't recall exactly how it happened, but I basically replaced most with new 78s (primarily 1920s stuff), and boy did I have a Whiteman collection, and at a time before eBay price-gouging. Lots of PW Columbias. This is the third edition of my 78 collection, and it's out of control. We all know how that goes. It's not a "We've all been there" thing--it's a "We're all there" thing. We have too much, and we keep adding. Well, your fretting about sound definitely is producing some good sounding records! Yeah, it's about a quarter-tone difference. Thanks for not objecting to my tinkering! No, I appreciate it. Especially given how much better it sounds with that small change. I'm happy to outsource the 78 rpm speed problem! By the way, I found that a slight reduction in the low freqs on these sides opened up the sound incredibly. My pre-treated file sounded pinched, and I knew that upping the treble wouldn't help, so I did the opposite. And it worked! I think it's the fault of all those Boomer-era stereo shops--our modern love affair with bass, I mean. I'll never forget the hilarious scene near OSU campus of a young couple listening to a clerk explaining a set-up in great detail--"blah blah blah percent harmonic distortion, etc." --as they listened quietly. Then came the part that mattered--cranking it up!! BOOM BOOM BOOM. The couple smiled, because they knew they were buying the best speakers in town. Because BOOM BOOM BOOM. "Can I get a job at your shop?" "Does your wrist turn to the right?" "Um... yeah." "Okay, you can start tomorrow." Lee - Thanks for your gracious response to my contribution! By the way, I believe most vinyl/shellac records suffer from rumble to a greater or lesser degree. A rumble filter sometimes does wonders in clarifying the sound, in my experience. Yes, rumble is a royal pain, especially on 1920s Columbias, I guess since they were so thick. Uneven surfaces will produce rumble, of course, so you'd think the thicker 78s would be less subject to warping over time, but what do I know? I was just listening to a Whiteman CD on (I think) Naxos, and the rumble was bad. Oh, and of course uneven playing surfaces aren't the sole cause of rumble. Much of it was in the recording process itself, I'm sure. The sonic horrors that can be found on commercial transfers always amaze me.